A polar bear mom and her cub wait for the sea to ice over. Name the Polar Bear Contest! Like last year’s Aurora, the scientists of Polar Bears International have collared a new polar bear for explore.org fans to track! 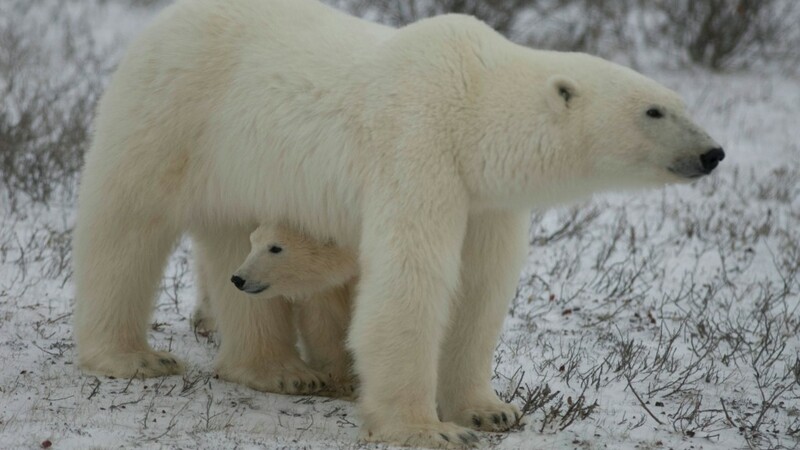 An 8-year-old mom with a yearling cub, she’s been given the name X33410, a number that the research team will use when tracking her throughout her life. But we want you to give her a more personal – and memorable – name! Every fall, polar bear scientists travel to Wapusk National Park in Manitoba, Canada, to monitor the western Hudson Bay polar bear population. They take size and weight measurements, and perform a census on the number of bears and cubs they see and catch. Some females get outfitted with GPS collars so they can be tracked throughout the year. The information gathered paints a picture of the lives of polar bears hunting out on the sea ice. This past September, X33410 was one of those collared. Researchers hope to read her life history and those of any cubs she produces. And you can go along on the adventure by monitoring X33410 with this Polar Bear Tracker! PBI will pop in regularly to give updates on what X33410 and her cub are up to. But she’s going to need a better name, so post your nickname ideas in the comments section of this blog, and yours could be the winner! Learn how to use the Polar Bear Tracker in this short film by Polar Bears International.